It’s almost exactly 100 years to the day (on the modern calendar) since the revolutionary insurrection in St Petersburg that led to the Bolshevik wing of the Russian Social Democrats gaining control of the major organs of power and establishing the rule of workers Soviets. There has been much written about the ‘Russian revolution’ since and in past few weeks and months. As this is a blog about economics, I shall just make a few notes about the economic foundations of the revolution and the ‘experiment’ of a planned, non-capitalist economy in a poor country amid the world of capital. In hindsight, that the Russian people decided to end the 370-year rule of the Ivanov monarchy in 1917 was no surprise. The world was changing: capitalism was becoming dominant and, with it, industrialisation. An absolute monarchy sitting on a peasant country that was industrialising in the cities was an anachronism. What was unique was that the Russian people went on to establish a republic and eventually a state where capitalism and imperialism had no control within just a few months. The objective conditions for change were ripe. Russia was a poor country. It had great resources but these were ‘locked in’ by the vast size of the country and the extreme climate. Even in 1914, 85 per cent of the population were still peasants. Peasants had to practise subsistence farming. Economically, the vast majority of the population contributed very little to Russian society. Rural peasants had been emancipated from serfdom in 1861, but the land was still owned by a few: 1.5% of the population owned 25% of it. Workers too had good reasons for discontent: overcrowded housing, long hours at work- usually as much as 10 hours a day, six days a week- very poor safety and sanitary conditions, harsh disciplines, and maybe worst of all, inadequate wages with concurrently rising inﬂation; a recipe for economic turmoil. In one 1904 survey, it was found that an average of 16 people shared each apartment in St Petersburg, with as many as 6 people in each room. But from the 1890s, under a succession of Tsarist ministers railways were built, foreign investment attracted and landholdings partially reformed. Economic growth rates averaged 9 per cent from 1894–1900. These were huge rates of change, even though most industrial investment was wasted on armaments because Tsar Nicholas II wanted to protect Russia’s position as a great power in competition with Japan in the east and Germany in the west. The Witte years of economic reform from 1890-1905 brought some certain modernization and industrialization with them, but this expansion was uneven and depended on foreign capital, mainly French bank loans. Then there were ﬁve consecutive years of bad harvests from 1901-1905. And the defeat by Japan in the 1906 war was the straw that broke the camel’s back and sparked the 1905 revolution – the dress rehearsal for 1917. 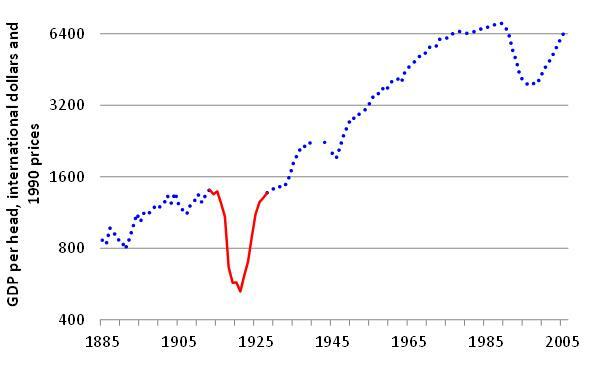 From 1905-1914, the economy grew at an annual rate of growth of 6%. Between 1890 and 1910, the population of St Petersburg doubled from just over a million and Moscow experienced similar growth. This created a new proletariat, a much more dangerous threat to Tsarism than the peasantry had been. From 1911 to 1914, political discontent grew. The First World War only added to the chaos; the vast demand for war supplies and workers caused more strikes, at the same time as conscription stripped skilled workers from the cities, and had to be replaced by unskilled peasants. The war brought famine due to the poor infrastructure of the railways and the need for supplying soldiers at the front. Ultimately, the soldiers themselves turned against the Tsar, bringing him down and with the formation of a republic eventually under the Bolsheviks the war was ended through an agreement on harsh terms with the Germans. In the two years following the Revolution, there was an economic catastrophe. By 1919, average incomes in Soviet Russia fell by half that of 1913, a fall that had not been seen in Eastern Europe since the 17th century (Maddison 2001). Worse was to come. After another run of disastrous harvests, famine conditions began to appear in the summer of 1920. An average worker’s daily intake fell to 1,600 calories, about half the level before the war. Spreading hunger coincided with a wave of deaths from typhus, typhoid, dysentery and cholera. In 1921, the grain harvest collapsed further, particularly in the southern and eastern grain-farming regions. More than five million people may have died prematurely from hunger and disease. Russia suffered 13 million premature deaths from conflict and famine. This was one in ten of the population living within the future Soviet borders in 1913. And all this while a savage civil war raged as invading foreign armies and reactionary domestic forces tried to displace Soviet rule. Eventually, after the victory of the Soviet government in the civil war and the stabilisation of the regime, economic performance, particularly after the New Economic Policy reforms from 1924, began to pick up. And then during the period up to 1945, there was a dramatic rise in GDP per capita with industrialisation under the planned economy. That accelerated after 1945 and up to the 1970s. 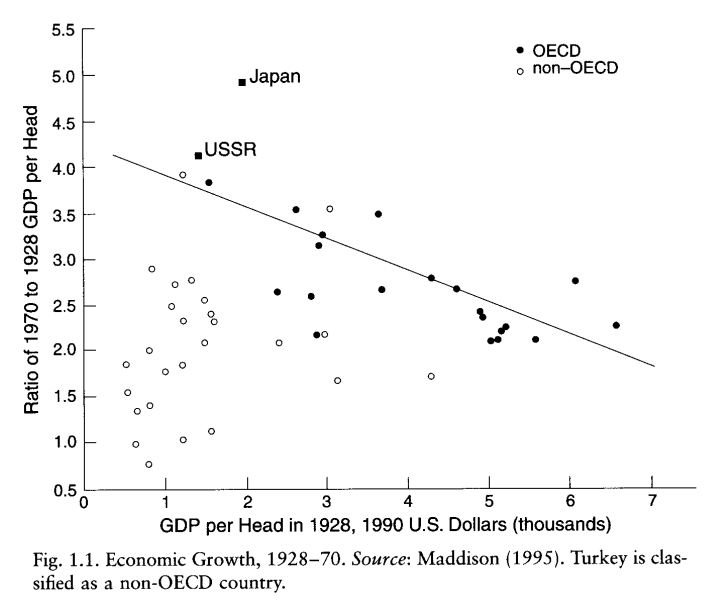 Indeed, from 1928-1970, the USSR was the fastest growing economy except for Japan! And even compared to the Third World, its performance was remarkable. In 1952, the Soviet Union was only behind Ireland and Western Europe as a whole. 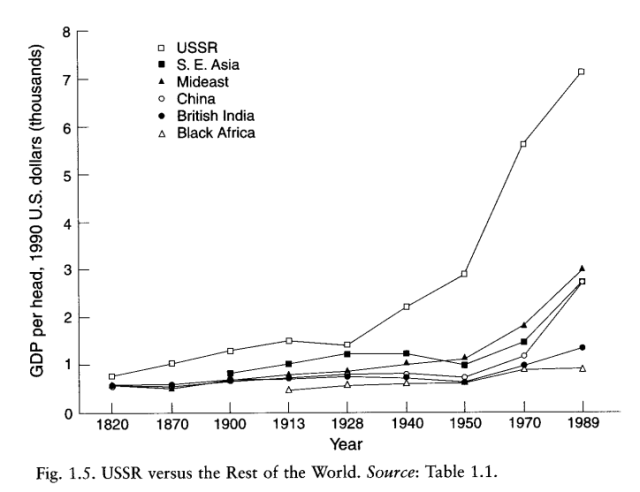 By 1975, the USSR had a higher GDP per capita than Mexico, Latin America, Colombia, South Korea and Taiwan. 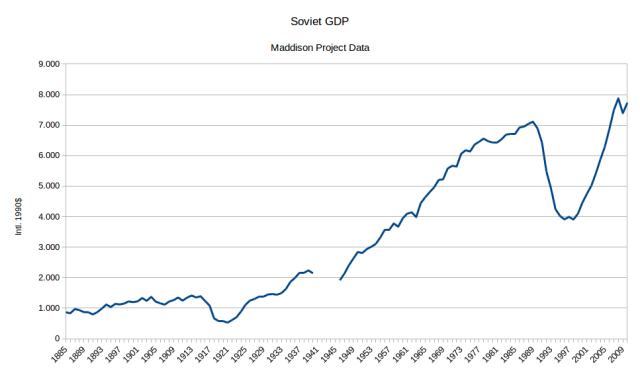 The success of the Soviet extensive growth model in the 1950s and 1960s was undeniable. But a phase of economic stagnation began in the 1970s. The attempt to move to a new regime of intensive accumulation to one based on high productivity growth failed. And the militarization of the economy because of the cold war used up valuable productive investment potential. The Russian elite tried to alter the economic model to one relying on the export of resources, rather develop industry and technology. The economy became a one trick pony. The attempt of Perestroika to build ‘market socialism’ and dismantle the plan was the final straw. Gorbachev’s reforms disrupted the system of planning and distribution and provoked chronic excess domestic demand and in the need for foreign imports. With the collapse of the Soviet state, the wealth acquired by Soviet state managers during the Perestroika allowed them to take advantage of the ‘shock therapy’ reforms in the 1990s, turning themselves into what we now call the Russian oligarchs. The ‘shock therapy’ introduction of capitalism led to the worst peacetime collapse in a major economy since the Industrial Revolution. By 1998, Russia’s GDP was 39% below its 1991 level. 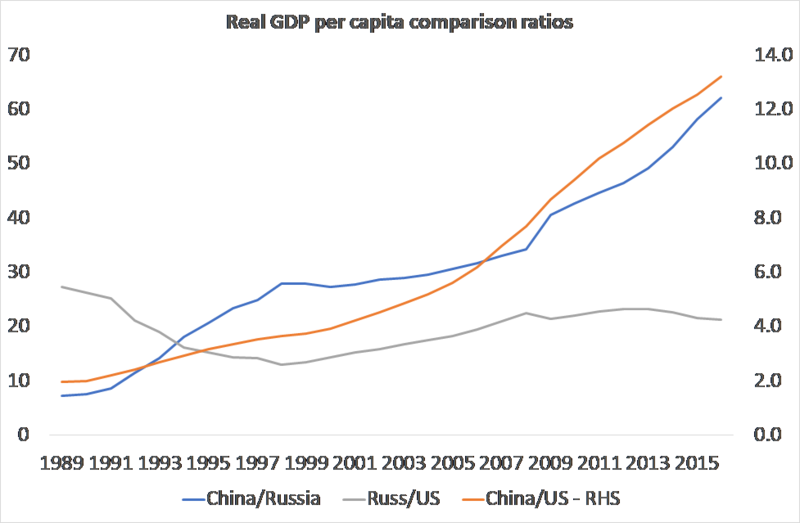 As the Russian economy imploded, the opposite was happening in China, where the relaxation of restrictions on private capital development was combined with state control and planned and state-led heavy investment. In the subsequent 16 years China has enjoyed the greatest economic growth ever seen in human history. The Russian capitalist economy eventually recovered with global commodity price boom after 1998, but by 2014, Russia’s average annual GDP growth was still only 1.0%. 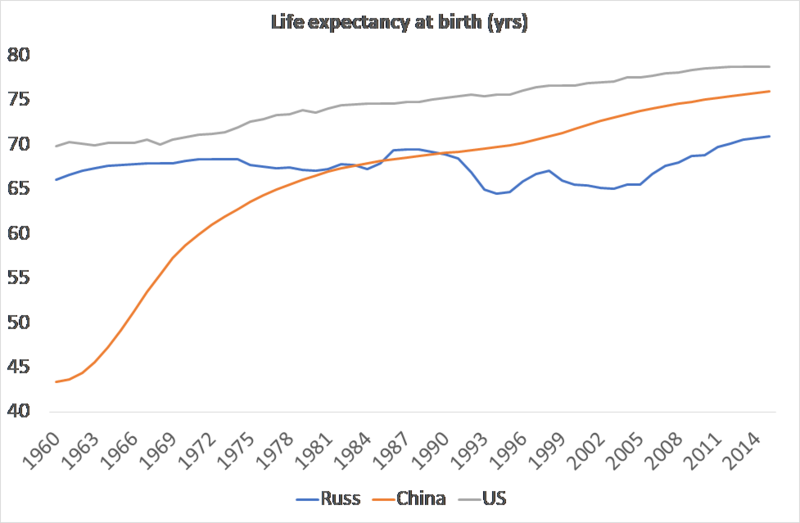 Life expectancy in capitalist Russia has now been surpassed by the Chines economic model. One key lesson that we can draw from the Russian experiment is that it could not succeed indefinitely in the face of world capital. Marx and Engels remarkably anticipated the eventual failure of the Russian Revolution. Marx thought that successful communist revolution presupposed the existence of an integrated world economy. Unfortunately, the revolution in the West did not materialise. While the planned economy succeeded in transforming the lives of millions, Russia was isolated, surrounded and very quickly the regime itself degenerated into a totalitarian dictatorship and finally into a corrupt capitalist autocracy far from the aims of the revolution of 1917. These are just a few notes. For a comprehensive description of how a socialist society might operate based on a commonly owned and controlled economy, see Ernest Mandel’s treatise, In defence of socialist planning. And for a compelling arguments on the feasibility of a planned economy delivering the needs of people, see Cottrell and Cockshott’s paper, Socialist planning after the collapse of the Soviet Union. This entry was posted on November 8, 2017 at 12:39 am and is filed under capitalism, economics, marxism. You can follow any responses to this entry through the RSS 2.0 feed. You can leave a response, or trackback from your own site. “Romanov” monarchy, not “Ivanov” monarchy. When I read it first, I though: “Seriously?! THE IVANOV MONARCHY?” Is it kind of akin to calling all Russians drunk Ivans? The war began in 1904 and ended in 1905 with the Treaty of Portsmouth in September of that year. Yes sorry about some factual errors – did this post in the middle of the night in Brazil. Well, this sounds like the usual Trotskyist trope. Calling Stalin a degenerate authoritarian(reminds me of degenerate workers state), as it something else was possible. Recalled the socialist in one country thing, as even the revisionists did try to expand socialism during the cold war. And yet, somehow, China is still socialist, as if they were not financing really right winger, downright feudal, regimes like Saudi Arabia and neoliberal bourgeois hardliners in Brazil, by taking important part in the buying of the pre salt oil fields, which are the largest here. The later really annoys me as I am a public servant, and feeding the ones in power is disgusting. Seriously, this anti communist propaganda about Soviet Union and apology for Dengist China is sickening. If someone wanted USSR to end capitalism before failing, well, fine, but should also consider that would very likely lead to a nuclear war. “Well, this sounds like the usual Trotskyist trope”. Actually, Michael’s sketch is even-handed and in the spirit of revolutionary socialism (even though not giving sufficient weight to the Soviet holocaust of WW2). The mysterious, multi-persona’d (and bloody) Daniel Rocha resuscitates the old, tragic quarrel between “Trotskyists” and “Stalinists” (but not the dead Soviet Union, “Stalinist” or otherwise) while excommunicating not-yet-actually existing “socialist” China from orthodox socialism–much in the spirit of his despised “trotskyite” anti-Stalinist undermining of the “bureaucratic” Soviet state. That old quarrel is of use only to those who want of undermine the socialist movement such as it is and because they oppose or fear real, needed change. I use multiple accounts as I cannot access all of them at work. Thanks for a couple of interesting, little-known facts, such as the figures on the rapid growth of industrial Petrograd. Michael, thanks for providing such a balanced account of the USSR economic history. I found your last paragraph the most intriguing. Given how dysfunctional the capitalist system is, you would think that professional economists would have a keen interest in replacing it with something better. Yet, it appears that it is only a tiny subset of Marxists that have the expertise and guts to explore how a post-capitalist system might operate in detail. That’s why I was so glad you cited Ernest Mandel. Ever since he published his ideas about socialist planning in the 1980’s, I’ve been wondering why so few economists have even acknowledged his very existence. Am I missing something here? I know he debated with Nove back then, but are there any current scholars looking at this subject? Is socialist planning a good fit for game theory? Allen “Farm to Factory” (2009) addresses these issues. He argues that up to 1989 only Japan had a better economic record. it is noteworthy that Allen, who does not evince any adherence to Marxism, has a more positive evaluation than some self-styled socialists, who do not hesitate to repeat the crudest bourgeois distortions . Louis Proyect for example is a veritable choir boy in falsetto for the fascist propaganda chorus of the Ukrainian Nazis. Allen ”Farm to Factory” (2009) addresses these issues. He claims that only Japan surpassed the Soviet Union in economic development until1989. (Did they have superior planning?) It is noteworthy that Allen, professor of economic history at Oxford, who evinces no adherence to Marxism, gives a more positive assessment than some self-professed socialists, such as Louis Proyect, a veritable choir boy in falsetto for the fascist propaganda chorus of the Ukrainian Nazis! Sorry, posted this twice. No offence to Louis! ”The issue of motivation – to efficiency, cooperation and innovation – is thus in no way an insuperable problem for a socialist democracy. A more immediate difficulty lies in the institutionalization of popular sovereignty itself. How can a maximum of basic consumer satisfaction be combined with a minimum of producer work-load? Alec Nove rightly dwells on this contradiction, which no serious Marxist would deny. But to register that this is a real contradiction – that you cannot produce goods and services ad infinitum in hours of human labour tending towards 1 or 0 a week, except with a ‘total’ robotism still lost in the mists of a distant future – does not mean that you cannot dramatically increase the satisfaction of basic consumer needs for all human beings, while simultaneously reducing no less dramatically the burden and alienation of the labour of the direct producers. A system of articulated self-management could go far to realizing these goals. Its main mechanisms and institutions would function as follows. Regular – let us assume for the sake of simplicity: annual – congresses of national, and as soon as possible international, workers’ and popular councils would determine the great divisions of the national product, starting from coherent alternatives previously debated by all citizens in the election of that congress. The choices – that is, the main foreseeable consequences of each option – would be clearly spelt out: average workload (length of the working week); priority needs to be satisfied for all through guaranteed allocation of resources (‘free’ distribution); volume of resources devoted to ‘growth’ (reserve fund – consumption of additional population – net investment as a function of technological choices again clearly spelt out); volume of resources left for ‘nonessential’ goods and services to be distributed through money mechanisms; minimum and maximum money incomes; pricing policy for marketable goods and services. The global framework of the economic plan would thereby be established on the basis of conscious choices by a majority of those affected by it. Starting from these choices, a coherent general plan would then be drawn up, utilizing input-output tables and material balances, indicating the resources available for each separate branch of production (industrial sectors, transportation, agriculture and distribution) and social life (education, health, communications, defence if that remains necessary, etc). The national or international congress would not go beyond these general instructions and would not lay out specifications for each branch or producing unit or region. Self-managing bodies – for example, congresses of workers’ councils in the shoe, food, electronic equipment, steel or energy industries – would then divide up the work-load flowing from the general plan among the existing producer units and/or project the creation of additional producing units for the next period, if the implementation of output goals made that necessary under the given work-load. They would work out the technological average (gradually leading up to the technical optimum on the basis of existing knowledge) – that is, the average productivity of labour, or average ‘production costs’ – of the goods to be produced, but without suppressing the least productive units as long as total output elsewhere does not cover total needs, and as long as new jobs for the producers concerned are not guaranteed in conditions considered satisfactory by them. In production units making equipment, the technical coefficients flowing from the previous steps would largely determine the product mix. In factories manufacturing consumer goods, the product mix would flow from previous consultation between the workers’ councils and consumers’ conferences democratically elected by the mass of the citizens. Various models – for example, different fashions in shoes – would be submitted to them, which the consumers could test and criticize and replace by others. Showrooms and publicity sheets would be the main instruments of that testing. The latter could play the role of a ‘referendum’ – a consumer, having the right to receive six pairs of footwear a year, would cross six samples in a sheet containing a hundred or two hundred options. The model mix would then be determined by the outcome of such a referendum, with post-production corrective mechanisms reflecting subsequent consumer criticisms. Compared with the market mechanism, the great advantage of such a system would be the far greater consumer influence on the product mix and the suppression of over-production – the balancing out of consumer preference and actual production essentially occurring before production and not after sales, with a buffer stock of social reserves additionally produced – empirically (statistically) optimized after a few years. Factory workers’ councils would then be free to translate these branch decisions at the level of the producing unit as they liked – organizing the production and labour process to realize all the economy of labour-times they could achieve. If they could reach the output target by working twenty instead of thirty hours a week after submitting their goods to a quality test, they would enjoy a reduction in work-load without any reduction of social consumption. These are Mandel’s proposals for the organisation of a socialist economy. Are they persuasive? What worries me is his assumptions of harmonious agreement at such congresses. What if the workers cannot agree their plans, for example in the matter of dividing the leather? ” without suppressing the least productive units as long as total output elsewhere does not cover total needs, and as long as new jobs for the producers concerned are not guaranteed in conditions considered satisfactory by them.” ”The model mix would then be determined by the outcome of such a referendum, with post-production corrective mechanisms reflecting subsequent consumer criticisms.” I find this somewhat vague. Who exactly decides what is ‘least productive…satisfactory…the model mix…..corrective mechanisms”? I do think we need much more detailed and concrete ideas to be convincing. Posting large chunks of unattributed text (in this case from Mandel’s “In defence of Socialist Planning” 1986) doesn’t facilitate debate. It’s a dishonest technique for padding out the posts in the thread and diverting attention from the main issues. You’ve done this in the thread on China and you’re doing it again here. Either say something original, or go away. No, I am not going away. Okay the text from Mandel is over long. I posted it to save others having to look it up. As for China etc. why do you not take issue with what I actually say, so that I and others may bathe in the celestial wisdom of your own elevated originality? Self management is OK, but, you have to organize a powerful army and also spread revolution around. Capitalism is a metastatic cancer, either you get rid of it everywhere, or it destroys you. The idea that the 2 systems can live together is a fraud. Either you have one or the other, unless you keep the cancer very quite, within small units, like small restaurants at most. More than that, is death for the system. Wasn’t Marx dead by the time of the Russian Revolution? Indeed he was. This remark was made in Marx & Engel’s 1872 preface to the Communist Manifesto. They were responding to a common query from socialists of that time. Everyone knew the Russian regime would have to be destroyed at some point, probably in a revolution somewhat similar to the 1848 revolutions from the era of the Manifesto’s original publication. Some Russian socialists argued that only a “bourgeois revolution” followed by a lengthy period of capitalist development was possible. Others argued that, because Russian peasants had a certain collective method of organising agriculture, Russia could skip capitalism and proceed directly to a peasant-based socialism, contradicting the Marxist notion that capitalism had to develop the productive forces before socialism could be possible. “The Communist Manifesto had, as its object, the proclamation of the inevitable impending dissolution of modern bourgeois property. But in Russia we find, face-to-face with the rapidly flowering capitalist swindle and bourgeois property, just beginning to develop, more than half the land owned in common by the peasants. Now the question is: can the Russian obshchina, though greatly undermined, yet a form of primeval common ownership of land, pass directly to the higher form of Communist common ownership? Or, on the contrary, must it first pass through the same process of dissolution such as constitutes the historical evolution of the West? Here, Marx and Engels almost exactly predict the attitude of the Bolsheviks in 1917, including Trotsky. The Russian revolution would be the starters’ pistol for a wave of European revolutions, which, if successful, would allow a Europe-wide transition to proletarian socialism, with Russia peacefully moving from backwards peasant agriculture to “communist development” with the aid of the advanced Western communist countries. But, as Marx and Engels clearly imply here, as Stalin’s development had nothing to do with “proletarian revolution in the West”, it did not, and could not, represent “communist development”. It industrialised and then collapsed, leaving a working class that was ideologically and organisationally ruined, after having led the whole world’s socialist movement in 1917. I’m a student of Economics and International Relations in URJC (Madrid). I am working on my Final Degree Project on The role of external insertion in Communist-inspired Countries: The Case of the New Economic Policy in the Soviet Union (1923-1928). I would like to compare the Chinese openness with the NEP and I want to defend the potential of international interconnectivity and state-directed development. Studying about China I have come to find a book called Le miracle chinois: stratégie de développement et réforme économique written by Justin Yifu Lin, one of the first Chinese to study in Chicago. How can it be otherwise, he defends the idea that it was the liberation of the agricultural market and the beginning of market pricing that is leading China to development. Let’s say that follows the Austrian-Hayekian thesis of the impossibility of socialism due to its inability to perform the economic calculation. Do you know any text that opposes this thesis or any interesting text about the NEP? Juan – this a big subject! I intend to look at some of these questions in a paper on china that I plan to write this year. The only thing that I have up to now is this. https://thenextrecession.wordpress.com/2015/09/17/china-a-weird-beast/china-paper-july-2015/ Suffice it to say that i do not agree with Justin Lin and the pro-market school on China.